One of the things I was really hoping to accomplish over Winter Break was making a bunch of cinnamon rolls. On the first day of the new year, I had the luxury of indulging my domestic urge and baked to my heart’s content. Edna Ruth Byler’s Potato Dough Baked Goods from the More With Less Cook Book has been my favorite sweet roll recipe for over 25 years. The recipe yields 100 sweet rolls (It really does; I counted them this time! ), which means a block of time (and energy) must be available for this undertaking. This also explains why it’s been a few years since I did this. 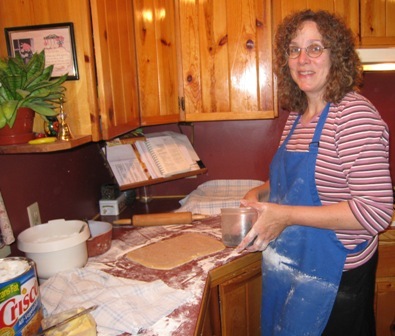 Here is a portion of the dough rolled to approximately 9″x18″ rectangle, spread thinly with butter, and covered with a layer of white and brown sugars mixed with cinnamon. 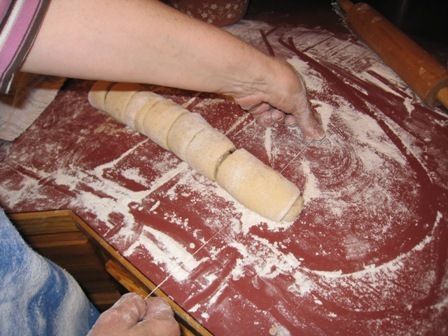 The dough has been rolled up and is being cut into equal portions using waxed floss. The rolls get squished if you use a knife to cut them. This keeps them nice and round. Yum! Cinnamon rolls, hot from the oven, just iced. Where’s the coffee? It’s time for a taste test! 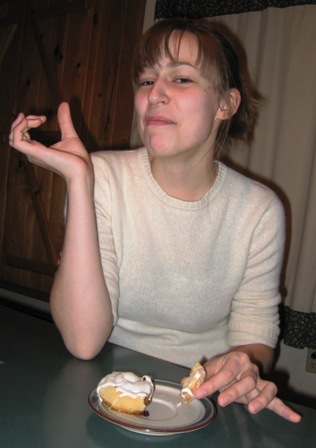 This entry was posted on Wednesday, January 2nd, 2008 at 12:12 am	and is filed under Fun Things, Homemaking. You can follow any responses to this entry through the RSS 2.0 feed. Both comments and pings are currently closed. Where did you get you’re super cool cook book holder thingy? I need one of those! WAXED FLOSS!?! that is the trick to having non smooshy cinnamon rolls! You’re so clever! Thanks!!!! Thank you, Laura. 😛 Next time I want to try combining the two recipes, using sweet roll dough instead of biscuit dough for the apple dumplings. I think it will be especially nummy! Hi, Amy. 🙂 I think you will need to look for the cook book holder online, since we purchased it about 18 years ago at a hardware store. Hope you find one! 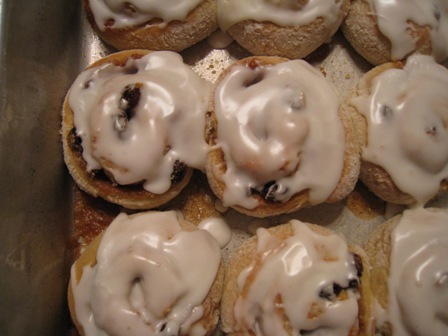 I”ll be over later for some of those cinnamon rolls…..looks heavenly!